Wake up at 5am and start doing chores is kind of amazing during these days (or any other day :P). I scrubs my toilets, doing laundry, clear up my full basket of cloths and making breakfast. I felt super women already. Haha. It's all because we will have a long day for carnival, aqiqah and wedding to attend. FYI, I don't have any property in my life. No cars. No house. No big investment. Nada! Thus explains the property carnival that we had that morning - just to start getting the feel of buying a house. Cewah. But that's not the main story. It was Hubs and his playful time. There was this one corner of the place where they provide free sand art sticker and Hubs was eyeing on this after we walked out from the showroom. I taught he's just being funny when he choose one of the sticker and asked me which one that I want, if I wanted to play the art as well. Of course I said no. This meant for kids or at least do-it-with-your-kids kind of things. He said he always wanted to do this since he know about it but it's kind of wasted when he knows he had to pay. 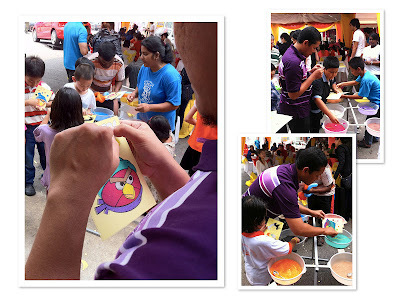 Since this is one of the opportunity that he don't want to miss, he start taking angry birds and choosing the color sands. I think he had a time of his life. Hehe. After finishing his last colored sands, there was this photographer asking Hubs if he want to take pictures for Father's day - with our kid(s). He laughed and point his finger to my belly. The photographer was laughing and said 'Oh sorry..I thought you already have one' - probably assuming he's doing the sand art sticker for our kid. 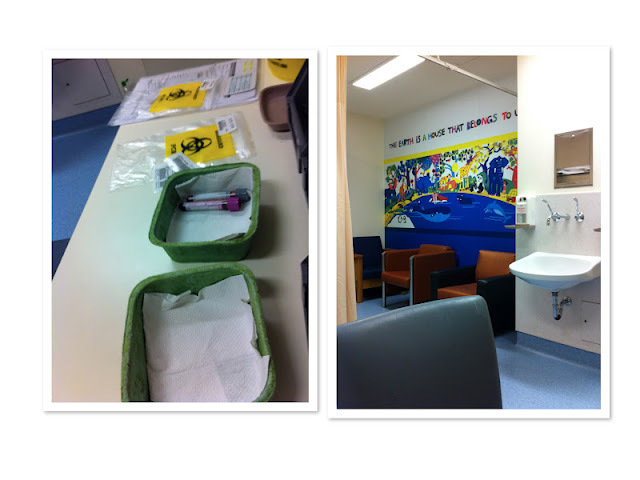 A good thing of having a specialist doctor is to be able to ask anything that you enquire which includes stupid questions :P but no such thing as stupid question, right? I asked Dr Seri about these two and she had given me piece of advice that myself and Hubs agreed with. It is not necessary and both is one of the things that business people could make money of. If you are a structured person and feel there's a need of knowing everything and what to expect during delivery, go for the antenatal class. Dr Seri mention, even during labor time, she'll explain what are the options and suggestion that she could offer which includes the all guidance during my labor time. I found myself more to go-with-flow kind of person, thus I don't think this is one of the must do item in my list. On top of the note, nothing wrong about learning and gaining knowledge. Dr Seri advised that as long I take care of my food intake, ensure that myself getting all the nutrients that I need - without over consume, that all already enough. Everything that mother eats will goes to the baby as well. She mention that some study proves that Jamu intake is not safe for babies. She also not agree with the old folks who control all food during our pantang days. I rest my case. How about yours? Hubs tengah kemaruk membeli almari when we decide to go for this closet. Mentang-mentang ade orang baru nak masuk kan, semangat lah die nak mengemas rumah ni hai. Bagus. Bagus. Me like! Actually we were thinking of getting another board to store stuff that has been bothering us at one of the side of the house. So to keep things more neat, Hubs decide to get one big closet to keep them inside. To our luck, we manage to get both, our closet and baby closet as well. Not as big as we imagine but enough to make the space neat. Lampu kat area bersepah tu rosak, so couldn't get a good picture of it but the main purpose it to get all the baby stuff nicely put in the closet. Kan hari tu da beli baju and do some laundry kan? Turns out ade berape helai je la hai yang dapatnyer. Seminggu pakai je kot baju babyku ini. Mittens and boots campak disini sebab xtau nak lipat camne -_-"
There's actually four drawers for baby storage tapi so far ini dululah yer. Menda lain tak tau lagi. Rase macam beli banyak benda je hari tu tapi bile dah susun-susun ni, tak banyak lah pulak. Takpe. Kite save for the future pulak yer. Shopping baby stuff is so much fun! and I amazingly finish 90% from my checklist within one day. It was so tiring that my feet cramps (and swolen of course) but I was just too enthusias that day to buy all the baby suff. It's all started when Along called on Friday night that there was Mothercare sales. She just went back from Bangsar Centre which they have bigger outlet and much variety compared to Midvalley and KLCC. Members get 10% discount on top of discounted item. Uuu.. I already tempted when I heard the sales but getting on top of the discount?? Win! Surveying the price before this kind of sales really helps us know how much we could save. 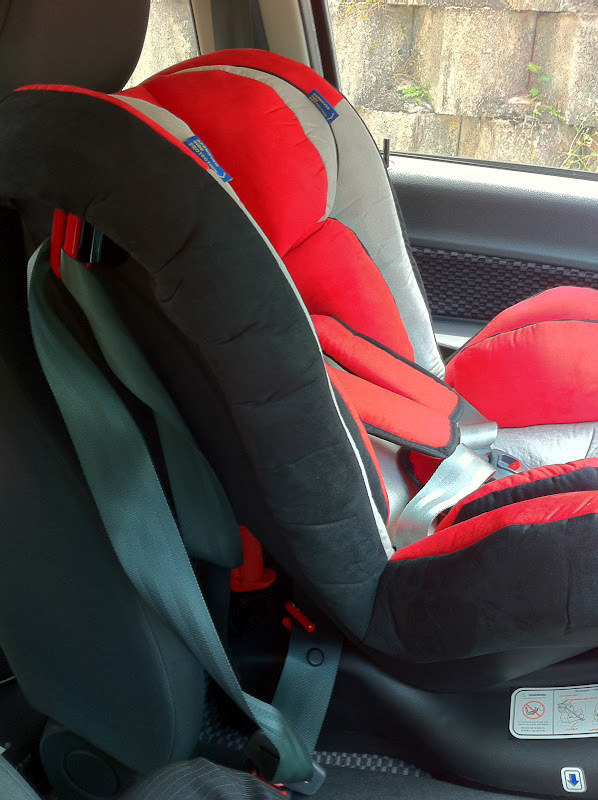 We bought Halford Zeus Plus car seats and few items that we found is a good bargain. 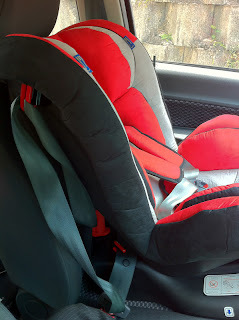 Love the services when they actually take the car seat to our car to test weather it fits to the seatbelt cause when we went to BBstore, the sales person said with confidence that the same model doesn't fit Saga and they actually tested it. So when we went to Mothercare, we asked the same question to them and they willingly to take it to our case and see for ourselves. Guess what? It fits nicely tau! Muat front and back facing okay! Marah betul sama itu BBstore tapi we still go back to them cause the stroller is cheaper at BBstore compared other places. 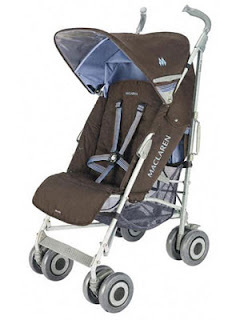 We choose MacLaren Techno XLR in coffee blue color! Love it! Tapi tak love BBstore punyer service sebab Hubs have to carry the stroller by himself. Not that there's no male salesperson. They don't even offer and just look at us bringing down the stroller. Dah la kne turun tangga tau. Not sure how other BBstore outlet service but kurang gemar service BBstore di Kuchai Lama. Dan marah jugak sebab they had a sale which they didn't post in online! We found out they sold Halford Zeus Plus with the lowest price I've ever seen. Tapi takpe. I prefer to pay more rather have this crappy service. Grrr. We went to PWTC Mommy and Baby Fair but nahhh.. no fun. Nothing much to buy. Exhibitors pon tak ramai but we did bought some items such Anakku cloths and Bebe breast pad. Itu je. Then went to Jusco for shopping the whole checklist. 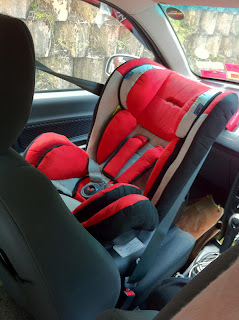 Menggila sebentar dekat baby area. So cheap!!! Lain kali tak payah tunggu expo ke fair ke kalau setakat nak beli baju, sabun, and other small little things for your baby. Jusco, Tesco or Giant would do lah. Went home almost midnight and straight away looking for bed. Sumpah penat gile. Haha. The next day, I did some clean up and unpack all the stuff in the cupboard. Ohh..the baby board!! I'll write about it later. 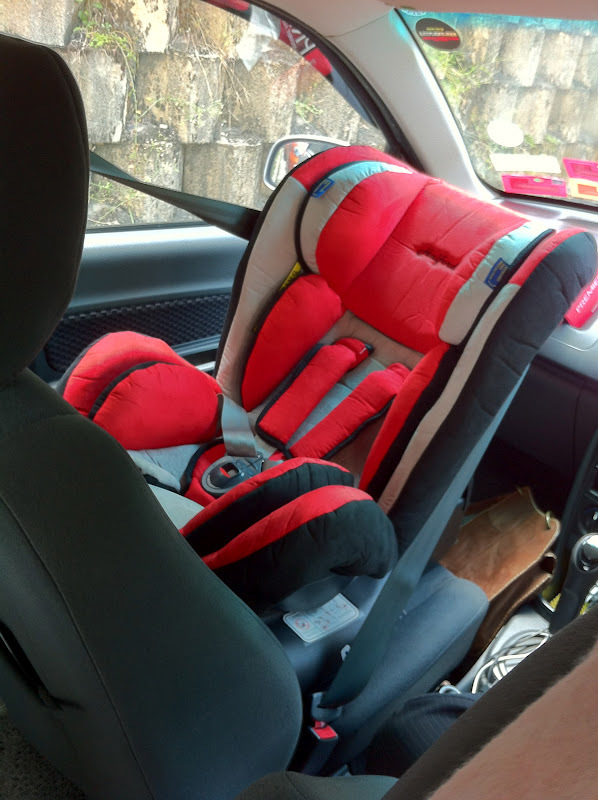 We manage to get my dream baby almari! 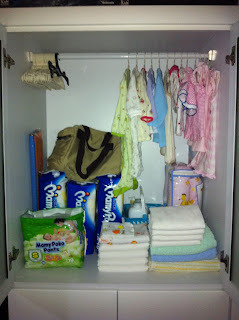 Yey :)) All the baby items is ready in the right place. Ohh...I almost forgot - baby's name!! The name must be meaningful, short and simple. Both Hubs and I don't fancy long and complicated names. Gotta look for google and start getting the list. Till later! !